Once upon a time, there was a felt stuffed monster. That monster wasn’t much to look at, and it certainly wasn’t scary. It was little more than a few pieces of purple material stitched together, with mismatched buttons for eyes and little fuzzy arms made to hug. And little Timmy loved it. And that monster had a secret. It was a magical monster doll! The conditions had to be just right for the doll’s magic to become known. It had to be on the first day of spring or autumn, when the 24-hour span of the day is divided equally between daylight and the night. And it had to be a dark moon, a night where the moon’s face is hidden and the sun’s light casts no hint of warmth on the world. Then the veil between the worlds is thinnest. Then the secret doors can open. On just such a night, Timmy was fast asleep, his beloved stuffed monster curled up next to him. As midnight approached the air in the room seemed to grow thick. Timmy moaned slightly in his sleep, but did not awaken. The time wasn’t right. Not yet. When the clock turned to midnight, Timmy’s eyes fluttered open. His favorite toy was sitting on his chest instead of curled up into his arm. And it…was…growing. Not the body of the doll, that stayed the same size. But a line appeared where no mouth had been before, and it grew, and then it opened. 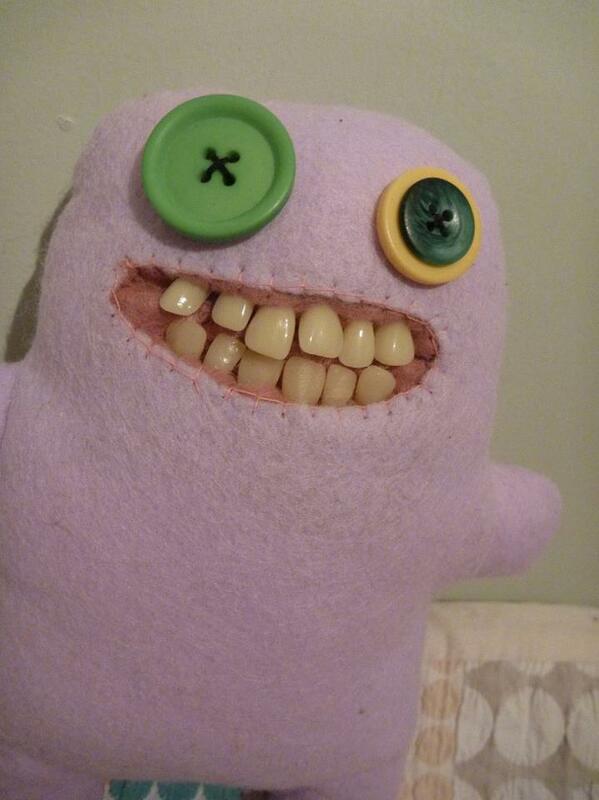 Timmy, still groggy from sleep, wondered why he never ever noticed his monster had a fully developed set of teeth before. The monster’s head kept growing, and the mouth kept stretching, wider, wider, as his favorite toy leaned closer to him. He heard a voice emanate from deep within the doll, at once whispering and filling the room. It said, “In his house at R’lyeh dead Cthulhu waits dreaming.” Timmy screamed once before the monster’s cavernous mouth descended upon him and enveloped him in blackness. By the time his parents ran to the room, Timmy was gone beyond the stars to the lost city of R’lyeh, to tend to the dead and sleeping Old Ones until they awaken and return to enslave the earth once more. His monster, his doll, his friend, sat benign and inert, upended on his pillow. Timmy’s mother picked it up forlornly and set it rightside up before leaving the room to call the police. If it still had its mouth it would have smiled. There were two more nights of the dark moon, and two more parents. Making family reunions fun since before time began. Today’s completely jacked suggested tag from WordPress? Tim Horton’s. That’s right, Tim Horton’s, the completely benign, welcoming, Canadian chain of doughnut shops. Perhaps they’re trying to lull us into a false sense of security with coffee and confections before tearing apart the barriers between the worlds? What are you up to, Tim Horton? Besides, of course, providing delicious cakey goodness and caffeine to the masses? Photo provided to MoWTF by friend of the museum Michael C., though I have no idea where in the hell he got it from. This entry was tagged Button eyes, Child care, Crafts, Cthulhu, Felt toys, H.P. Lovecraft, Hellspawn, Inappropriate child's toys, Nightmare fuel, R'lyeh, Tim Horton, Why does this thing have human teeth?. Bookmark the permalink. ← Now Available at the WTF Gift Shoppe and WTF-o-Rama!